PRETTY PAW is the brain child of Canadian Accessory Designer, JOSIE TECSON. Being in the fashion industry and specializing in custom bridal jewelry, clients frequently asked for glamorous jewels to outfit their pets with in order to include them in their weddings. JT launched PRETTY PAW in 2008 with a collection of Swarovski jeweled collars – The Petite Elite Line, which was featured in Wedding Essentials and numerous of media publications. The features in Pet Fashion TV and runway shows catapulted the brand in North America. The birth of PRETTY PAW ambassador/spokes model – Miss Asia-Blu inspired JT to create the ever-popular ‘Designer Step-In Pet Harnesses’. Asia-Blu had the tendency of pulling during walks with her mom, which resulted in bruising around her trachea area. When JT brought this to the attention of her vet, he recommended that she put her in a harness. Shopping for the ideal harness turned out to be more difficult that she had expected because nothing seem to fit comfortably for Miss Blu. JT decided to create and customize a harness that was not only comfortable, but also fashionable, especially functional. 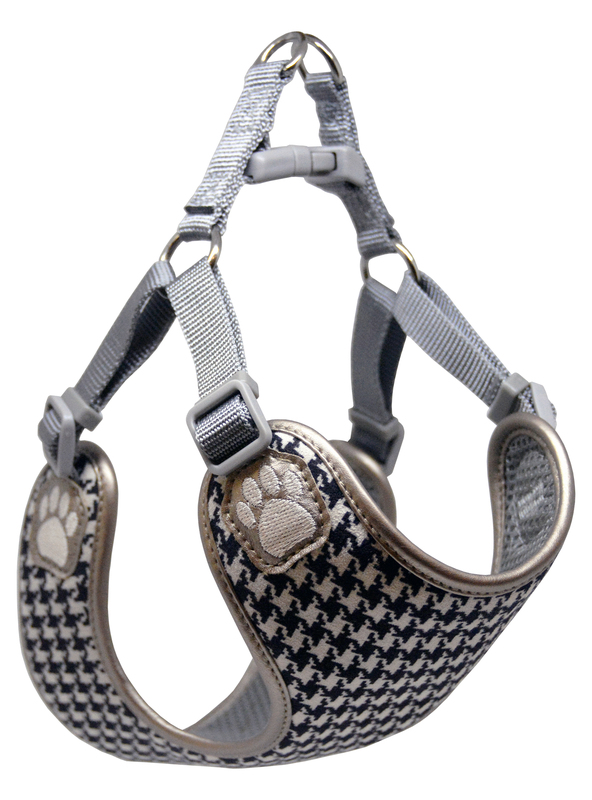 The ‘Designer Step-In Pet Harnesses’ are created for the love our pets – “designer trends for your four-legged friends”. The Designer Step-In Harness’ style evolution is inspired from global trends that are fresh off the runway season. Textiles from all over the world tailor the contemporary line with latest fabrics, which are implemented in every year’s ‘Fashion Couture Collection’. They are created with a beautiful selection of stylish fabrics that emulate the trends for every season. Every piece is created with a cushioned quilt and layered with a soft mesh on the inside panel for added comfort. With the enhancement of innovative and dynamic engineering, the advanced composition not only strengthens important key elements, but also elevates technical components expanding into a larger market for the bigger breed canines. 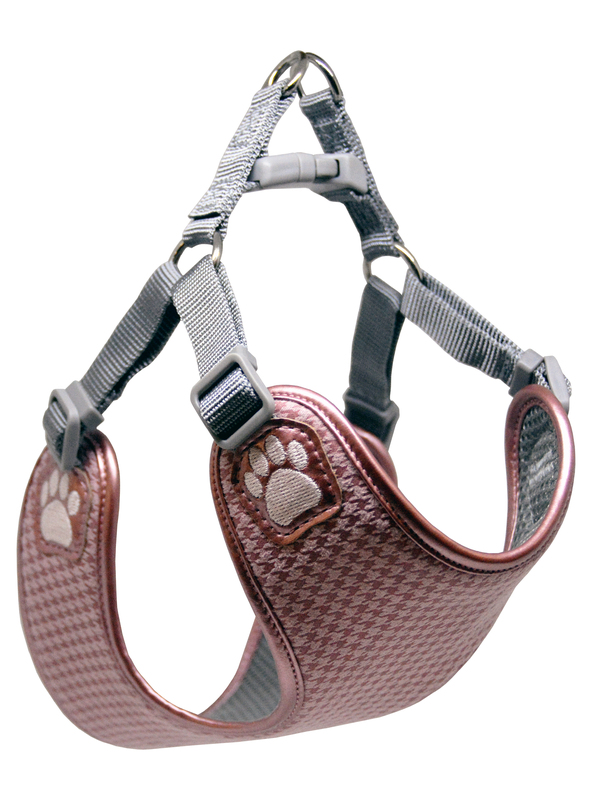 Every Pretty Paw dog harness is designed to prevent bruising around the pet’s trachea area when pulling. It is also reinforced under each corner to add strength, withstand stress and ensure durability. The straps adjust to measure the neck and chest girths accordingly to ensure a perfect and comfortable fit. 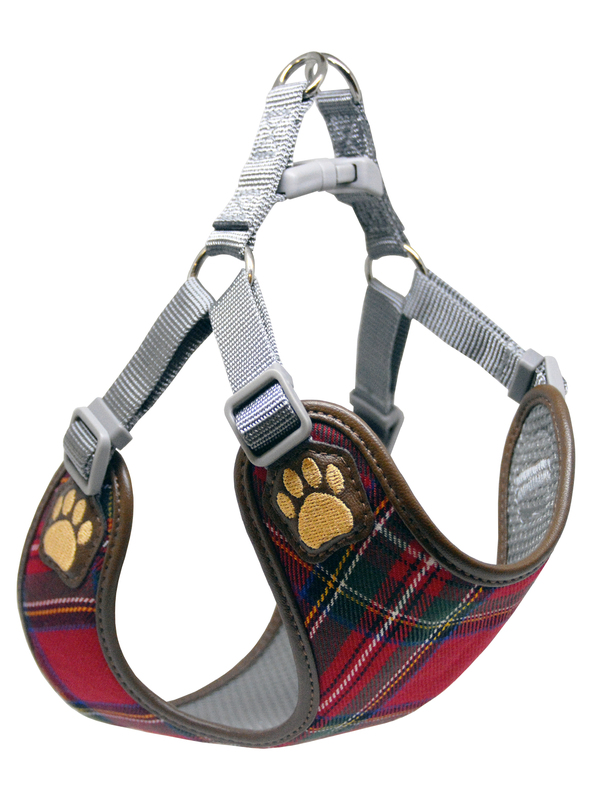 The dog harnesses are also designed with an easy fasten side-release buckle, which secures your pet into place. 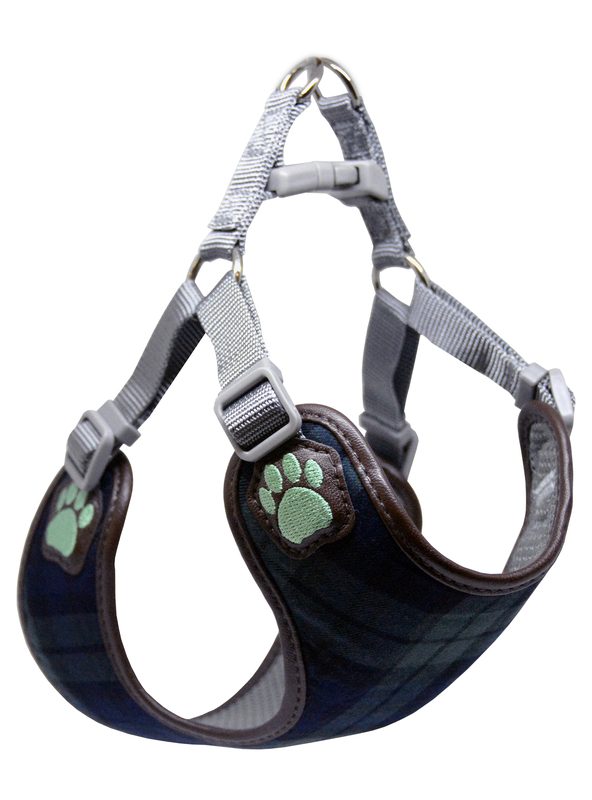 The center rings above allow for attachment of a leash for those long and happy walks. All components used in the design are animal friendly. The harnesses are machine washable – delicate cycle, cold water and hang to dry. PRETTY PAW always strives to consistently utilize natural materials that are animal friendly generating mass appeal within the pet fashion industry.